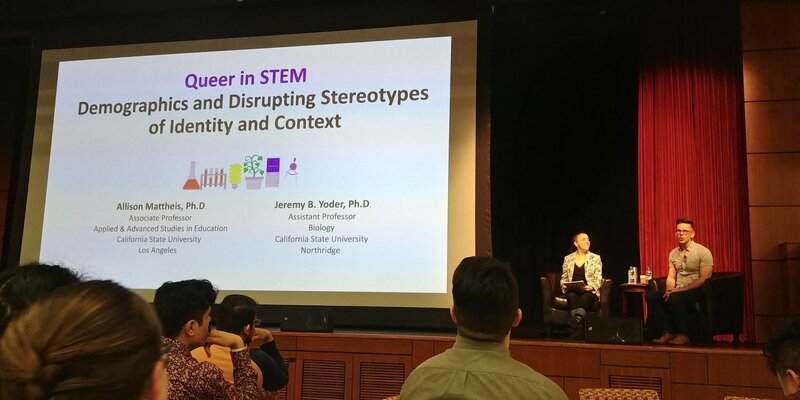 CSUN Assistant Professor of Biology Jeremy Yoder presented new results in an ongoing study of lesbian, gay, bisexual, trans, and otherwise “queer”-identified professionals working in scientific careers alongside his collaborator, Associate Professor Allison Mattheis of CSU Los Angeles, this past Sunday at the University of Southern California as part of the Out to Innovate conference. Yoder and Mattheis are the founding collaborators of the Queer in STEM project, which has surveyed queer-identified people working in science, technology, engineering, and mathematics to understand the diversity of sexual and gender minorities working in STEM and their experiences in the workplace. Their first national survey, published in 2016, found that over 40% of queer STEM professionals concealed their identities from colleagues or students, and that survey participants were more likely to be “out of the closet” in workplaces they rated as welcoming and supportive. In their Out to Innovate plenary presentation, Yoder and Mattheis reviewed these results and reported findings from a new paper, now in press, analyzing one-on-one interviews with survey participants, as well as data from a second survey led by Stanford University Thinking Matters Fellow Joey Nelson.